BBC 1's ground-breaking Planet Earth series was viewed by over 8.5 million. A hardcover book bearing the same name as the series has also been published. It was released a few weeks prior to the TV series as pre-publicity. The book ranked in the Top 10 best selling non-fiction books in the UK for several weeks. Unheard of for a wildlife book! Mike Holding wrote an entire chapter on the Okavango. This awe-inspiring book follows a new landmark TV series, Nature's Great Events, which showcases our planet's most spectacular natural events; from the flooding of the Okavango Delta in Botswana, to the polar bears' hunting being disrupted by the melting Arctic. Each chapter focuses on a different location and shows how immensely powerful natural forces can produce epic chain reactions. The epic scenic shots are in juxtaposition with the intimate and emotional stories of individual animals as they struggle for survival. "I have to say I am heartily impressed. This book should be compulsory for everyone in the industry, and for anyone yearning to get into it." Jean Hartley - Location Manager, Kenya. "I am very impressed! What I would have given thirty years ago for such a thing." Nick Gordon - wildlife film-maker. 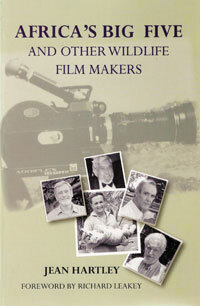 If you work in the wildlife film-making industry - or want to - you need this book! • The ONLY guide to working in the wildlife film-making industry. • Featuring many case studies from all over the world - successful professionals explain how they got started and give hard-won advice. • Case Studies include: Nick Gordon, Doug Allan, Mark Deeble & Victoria Stone, Mike Holding and Tania "TJ" Jenkins, Peter Crabb, Brian Leith, Jeremy Evans and many more. Jobs discussed include: Producer, Assistant Producer, Researcher, Production Assistant, Administration and Publicity Co-ordinator, Director, Cinematographer/Camera Operator, Camera Assistant, Sound Recordist, Presenter, Narration Script-writer, Narrator, Music Composer, Picture Editor, Dubbing Mixer, Location Manager, Distributor, Broadcaster/Commissioning Editor, Stock Footage Library Manager, Multimedia Producer. "You want a career in wildlife film-making? Then acquire and read - but most importantly - act on this book. It will really help you. People already in the industry, I feel sure, will also be glad to have this volume, or at least to dip heavily into it. They too can learn some new things, if only how widely and deeply held some views are held, and some understandings understood. It's all in this book, and much more. If you put it to work for you, this volume can do much for you – and thus, longer term, for the profession." "I’ve wanted to be a wildlife film-maker for as long as I can remember but knew it was competitive and had little idea how to get started. Then I found this book. I suddenly feel like I know so much more about the industry and have much more confidence. The case studies of many of my heroes were fascinating and made me feel like I did have a chance after all. I also have a much clearer idea how the wildlife film-making business works and how professional movies are made. I had no idea how many different people and jobs were involved in film-making and this book covers them all. This is the only book on this topic ever written – so if you want to work in wildlife film-making you can’t really do without it." Jean Hartley, born in Kenya, is acknowledged as being the first to legitimise "fixing" for wildlife film crews. Over the last 25 years, she has worked on over a thousand films, the vast majority being about wildlife and nature. In this insightful book she features five of the great film makers who all started their careers in Kenya in the 1950s, legends whom she is proud to call personal friends. Watching all their films, and many more, she became fascinated by the history of film making in Kenya and determined to find out when it all started. She traces the roots of wildlife film back a hundred years, drawing on accounts of the original film makers and the professional hunters who guided those early safaris. She tracks the changes from those grainy, speeded up, silent films through to the technologically perfect High Definition and 3D films that are being made today. You may order by: Credit Card Online (secure) - Credit Card ordering is processed via PAYPAL - or by cheque. The African wild dog (Lycaon pictus), also known as the painted wolf because of its unique markings, once ranged widely across the vast plains of sub-Saharan Africa. Today, as a result of habitat loss and extermination by livestock farmers, Africa's most endangered large carnivore is threatened with extinction. Focusing on one of the few remaining populations of African wild dogs, Running Wild depicts the fascinating daily life of the Mombo pack in Botswana's Okavango Delta. Illustrated with more than 300 color photographs, an authoritative text and detailed field notes document the hunting behaviour, play rituals, and natural history of this unusually social carnivore. The book discusses both the historical and political issues surrounding the species' conservation. A predator upon Africa's domesticated livestock, the wild dog has been targeted - much like the wolf and the coyote in North America - as a wanton killer and a threat to farmers. Uncovering extraordinary new facts about the life and habits of the African wild dog, the authors dispel long-held myths about this much-maligned species and argue for its importance in maintaining a balanced ecosystem in one of Africa's most pristine natural environments. With a glossary, an extensive bibliography, and a comprehensive index, Running Wild provides an in-depth view of African wild dogs, their conservation status, and their prospects for survival. In 1989, the authors and photography team Helene Heldring and Dave Hamman embarked on what would become a four-year effort focused on the African wild dog. This coffee-table account includes over 300 superb color photos offering a broad picture of the pack's behaviors, from pack structure to hunting techniques.